SWISS LADY'S PENDANT WATCH DIAMOND AND ENAMEL AND GOLD Anonymous, Swiss. Made circa 1900. Fine and rare, 18K gold, enamel and diamond keyless lady's pendant watch. Accompanied by a black ribbon. 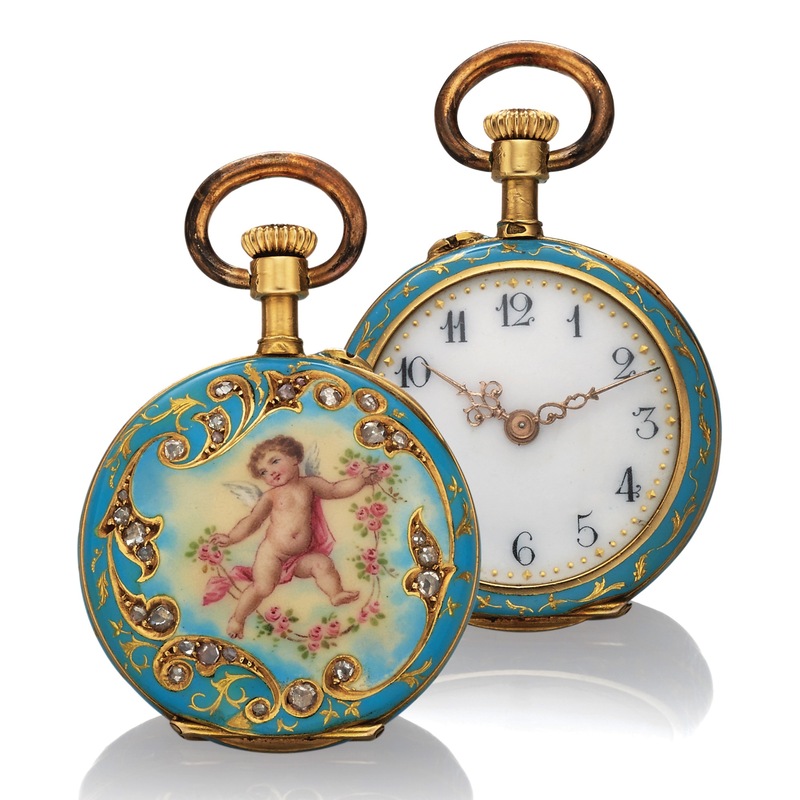 Four-body, "bassine," bezels and band decorated with green enamel and gold floral inlay, case back set with 19 single-cut diamonds and a multi-color champlevé enamel painting depicting a cherub. Hinged gold cuvette. White enamel with Arabic numerals, outer gold dot minute divisions. Gold Louis XV hands. 9''', frosted gilt, bridge caliber, 13 jewels, cylinder escapement, three arm brass balance, blued steel flat balance spring, index regulator. Unsigned. C. Four-body, "bassine," bezels and band decorated with green enamel and gold floral inlay, case back set with 19 single-cut diamonds and a multi-color champlevé enamel painting depicting a cherub. Hinged gold cuvette. D. White enamel with Arabic numerals, outer gold dot minute divisions. Gold Louis XV hands. M. 9''', frosted gilt, bridge caliber, 13 jewels, cylinder escapement, three arm brass balance, blued steel flat balance spring, index regulator. Unsigned.